The King himself ruled the kingdom of Israel for over forty years, amassing great wealth and an astonishing number of wives, so it’s clear he spoke from experience. Today, Baby Boomers, the largest generation in US history, is turning 65 at the ate of over a thousand a day, and the ways in which they use their length of days is changing the face of the housing market. Although most economic profiles acknowledge the impact of the Baby Boom generation on American society as a whole, it’s not clear just what that impact will be. In some models, this group will drag the economy down, as more and more people retire, spend less, and pour savings into medical care and assisted living. In others, the Baby Boomers represent a largely affluent class who, freed from the demands of careers and raising children, has the money to spend on high-end goods and travel. Leaving aside the obvious folly of making generalizations about a group that includes millions of people born all over the country in a 19-year time span, the latter assessment seems to be true for at least a relatively large percentage of Baby Boomers. Many of these new retirees and those approaching retirement age are opting to begin a new life that includes new living arrangements. And for investors in rental income property, that can be a very good thing. 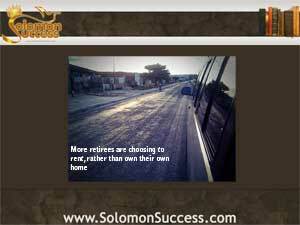 Although the housing market is making a shaky recovery and low mortgage interest rates create nearly ideal conditions for buying or refinancing a home, a large percentage of those Baby Boomers are opting to rent living quarters of some kind rather than maintain a traditional single family home or retirement village until it’s time for a nursing home. With choices that include houseboats and RVs, apartments, condos, townhouses and apartments as well as a variety of co-housing and swapping arrangements, thee newly minted senior citizens are leaving home ownership behind. That’s good news for income property investors following Jason Hartman’s advice on wealth building through real estate, particularly those in urban markets with a wide range of intellectual, cultural and creative attractions. A number of demographic studies reveal that younger, well-educated retirees want the stimulation and variety of city life, rather than the stereotypical retirement home in the country. Vacation and short-term rentals are also popular with this new breed of “young-old” retirees. This group of new renters makes highly desirable tenants: mature, responsible and able to pay the rent required to have the accommodations they want. They’re more likely to take an active role in taking care of the property, too. There won’t be damage from wild parties or complaints from the neighbors to deal with.